The recent discoveries of massive gas fields off the coast of northern Israel, tantalizingly close to Lebanese coastal waters, has stirred cash-strapped Lebanon to accelerate efforts to begin its own oil and gas exploration. But the prospect of previously undiscovered fossil fuel riches off the coasts of Lebanon and Israel risks becoming a new source of conflict as well as an economic windfall for the two warring neighbors. “This is something big and potentially landscape-changing economically, financially, and politically,” says Nassib Ghobril, head of economic research and analysis at Byblos Bank in Beirut. Last year, a US-Israeli consortium discovered the Tamar gas field 55 miles off the coast of northern Israel, which contains an estimated 8.4 trillion cubic feet of recoverable gas – the largest natural-gas find in the world in 2009. Earlier this year, a field called Leviathan was discovered in the same area with an initial estimate of 16 trillion cubic feet of gas. 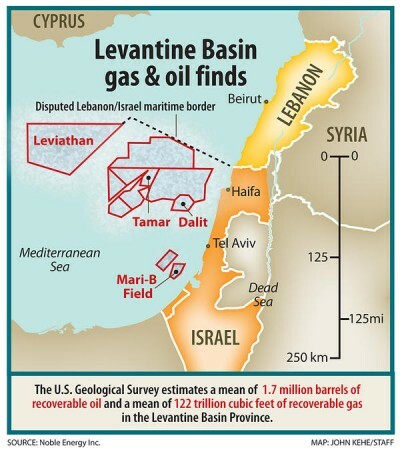 But there are likely more untapped fields; the US Geological Survey (USGS) said in March that the Levantine Basin, which includes the territorial waters of Lebanon, Israel, Syria, and Cyprus, could hold as much as 122 trillion cubic feet of gas – and 1.7 billion barrels of oil. Israel, which could become energy self-sufficient if results meet expectations, began test drilling the Leviathan deposit Oct. 18. The same week, Lebanese Prime Minister Saad Hariri said that Lebanon was close to marking its maritime boundaries with neighbors Syria and Cyprus, which should allow oil and gas exploration licenses to be issued by early 2012. The prospect of oil and gas beneath Lebanon’s coastal waters could have immense benefits for a country short on natural resources and encumbered with one of the highest debt rates in the world, around $52 billion or 147 percent of gross domestic product. But Mr. Ghobril, the economic analyst, cautions that it is too early to anticipate an oil and gas boom for Lebanon. A draft bill on energy exploration passed by the Lebanese parliament in August deferred politically sensitive aspects such as deciding on the regulatory body and how to handle any revenues. Lebanon’s notoriously turgid bureaucracy and political infighting could also delay the process. The maritime border between the two countries has never been delineated because they have officially been at war since Israel declared independence in 1948. Israel says its gas concessions lie within Israeli waters, but it remains unknown whether the gas field extends to beneath Lebanon’s territorial waters. The Lebanese government recently handed to the UN documents marking what it believes is the correct path of Lebanon’s maritime border with Israel. In the absence of a mutual agreement on the border and division of resources, Israel could follow the “right of capture” rule, which allows a nation to extract oil or gas from its side of the border, even if the reserves stretch into another country’s territory. Some Lebanese politicians have accused Israel of attempting to steal Lebanon’s oil and gas resources, and militant Shiite Hezbollah has sworn to use its weapons to defend them. Israeli officials have warned of retaliation for attacks on its oil and gas facilities. The UN has been here before. In 2000, when Israeli troops in south Lebanon were supposed to withdraw to satisfy UN resolutions, the UN created a “Blue Line” conforming to the Lebanese/Israeli border. The UN insisted that the Blue Line had no legal standing but was simply a measure for Israel’s troop pullout. However, the delineation process took longer than planned because neither side was willing to concede an inch of territory. Israel has placed buoys where it believes the sea border lies, and routinely defends it with armed force. The UN does not recognize the line as legally binding, but the naval component of the UN peacekeeping force in south Lebanon observes a 1.25-mile buffer north of the line to avoid potential confrontations with the Israeli navy. While the UN’s International Court of Justice has ruled on maritime borders in the past, analysts doubt that the UN will risk becoming embroiled in another boundary dispute between Lebanon and Israel – especially with potentially billions of dollars of oil and gas revenue at stake. Territorial waters are irrelevant. It’s the continental shelf that is important. Territorial Waters are important and the right of Lebanon’s Phoenician/Mediterranean Ancestry, No country can claim to have a right before Lebanon, No Country who violates UN resolutions, like Israel does, infiltrating international Diplomacy with corrupted allies like England and USA. Israel don’t have the right to exploit/steal Lebanese natural resources, Lebanon is been there 7000 Years before the Land Grabbing Israel. Our Ancestors the Phoenicians Dominated the Mediterranean before the Jews knew which way they should go and take some land. The UN has become a Bordello where its members sell themselves for money to the interests of Israel and its allies. Actually, Jewish sailors from the tribe of Dan used to work alongside the Phoenicians on trading vessels, and were historically quite amicable. But if we’re getting all historical, the northern boundary of the tribe of Dan was the Litani River. So… there you go, my friend. I suppose, thinking back to the Phoenician times, the Israelis only wanted the water from one side of the Litani … since it seems they had a bad habit of filling in a few wells people had dug years ago. Trouble is that the Hezzys want everything … even the water that flows into the ocean and what’s under it as well. 7000 ?? Wowow … that’s a stretch … and now, without going into ancient history, ‘Lebanon’s notoriously turgid bureaucracy and political infighting’ are causing most of the problems of a MODERN age. Try to find a ‘national’ belief system of one-government democratically elected before attempting to re-define borders back to what they were 7000 years ago. You’d have to blame Egyptians for everything wrong in the Middle-East too, in that case. Oh .. wait … maybe you do. Hmmm …. Actually, now, Lebanon will just ‘give’ everything needed to Syria since Syria(now, once again) controls the government. Poor Lebanese … well, ONCE they had a country! Can anyone explain why My Pro Lebanese Comments are not being posted, is that Yalibnan is anti Lebanese? You bet Lebanon will get from it’s natural resource it’s share. Lebanon is not a weak country to stand aside from it’s own rightful and deserved growth. It was weak enough to allow Hezzys to take over and hand it to Syria. Yah … HeeHee, there doesn’t NEED to be a dividing line between Lebanon and Syria does there?? Save a lot of geographical wrangling. Who decided that the “disputed” line gets such a northern angle favoring Israel I wonder. actually, if you draw a straight line across the coast line of both countries you will find that the dotted line is at a 90 degree angle with the coast line, which makes it a fair dividing line between the two countries. It isnt a northern angle at all, just an optical illusion because you are judging it by the Sinai coastline as a refference point.